It is impossible for us to know the exact date that humans first began to mine gold, but those sparkling artifacts have been the symbol of nobility for thousands of years. From the oldest known goldmine in what is now the nation of Georgia to modern mining machines, the charm of gold never dies. The Goldmine is unlocked at Town Hall 10. It is one of the four main resource buildings in Rise of Kingdoms beside Quarry (for Stone), Lumber Mill (for Wood) and Farm (for Food). The building Goldmine produces Gold overtime. You need to tap on the Goldmine to collect Gold after a preriod of time. By upgrading the Farm, you increase its Good Production Speed, Max Food Capacity and the overall Power. 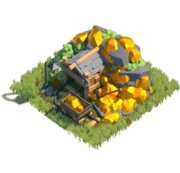 Players can get the lots of rewards by upgrading the Goldmine. 25 10,400 104,000 735,046 25 ? ?